Karadayan nombu is a major Tamil festival celebrated during the Tamil month of ‘Masi’. This is also known as the ‘Savithri Vratham’ or ‘Savithri Nombu’. Karadayan nombu is celebrated by married woman for the well being of their husbands. 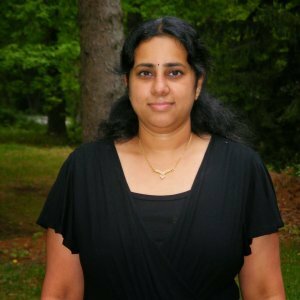 This is celebrated in honor of Sathi Savithri bringing back her husband from the footsteps of death and freeing him from Lord Yama. As with any Indian festival, this also has its unique menu. 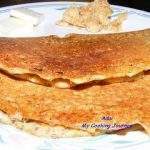 The sweet adai is prepared of rice flour, jaggery and karamani. 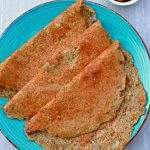 To go with the sweet, a salt adai is also prepared. It is served with a dollop of freshly churned butter. When offering the prasadam, women chant the above mentioned verses and pray for the well being and long life for their husbands. Fry the rice flour very well until the color slightly changes to pinkish red. 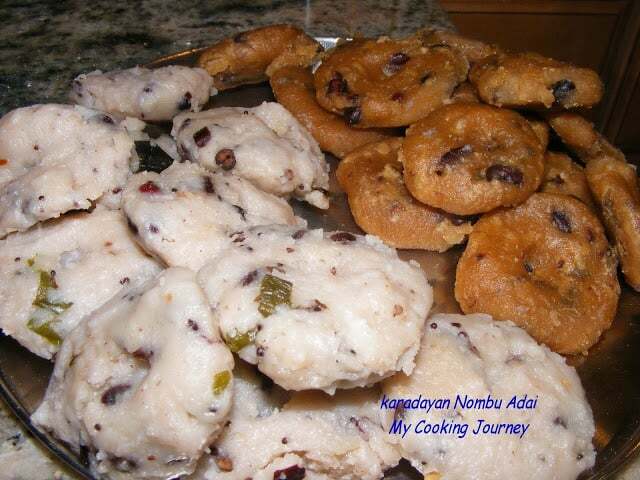 For both the sweet and the salt adai, we need to fry the flour, so fry 2 cups of rice flour and then split it. 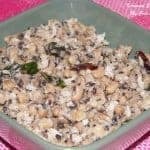 Traditionally raw rice is washed, dried and then ground to rice flour, but it works equally as well using the rice flour. 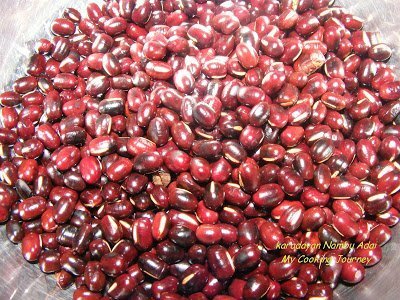 Dry roast the karamani to reddish color and then soak it overnight in water. Then pressure cook it and keep aside. This step is also common for both the adais. In a heavy bottom pan, melt the jaggery in the water and let it come to a boil. 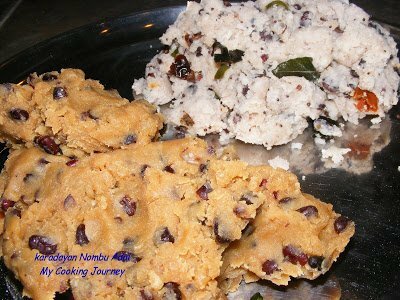 To this add the coconut, karamani, elaichi powder and then the rice flour and mix well to form dough. The dough should not be too wet. If so add more rice flour. The dough should appear slightly crumbly. At this stage take it off the flame, cover it and keep aside. Once it cools down a bit, mix it well using hands. At this stage to bring the dough together a little bit of hot water could be sprinkled. Make balls out of the dough and flatten it in between the palms and make a dent in the center. 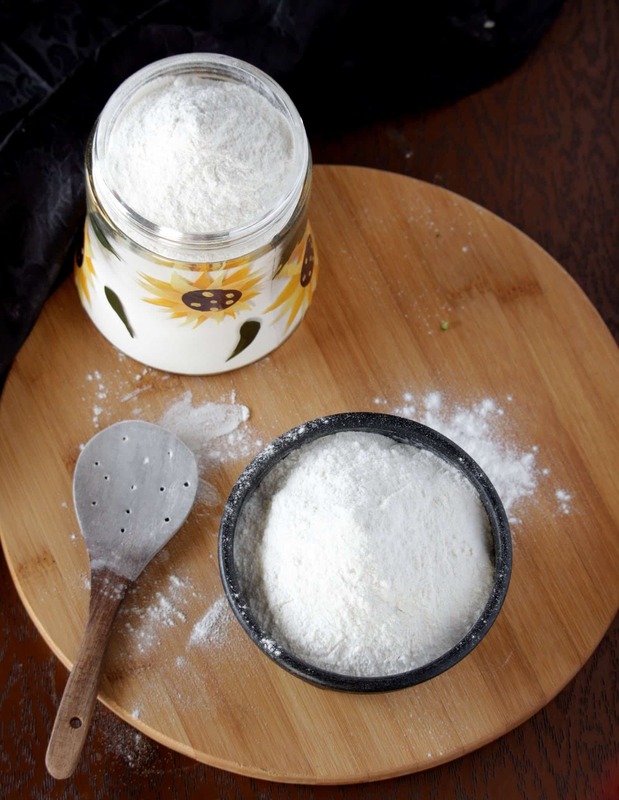 Steam the adais in greased idli plates for about 12-14 mins. Once taken out of the cooker, they should appear glossy. The adais are very soft and fragile right after they come out of the cooker. Let it rest for few minutes and then remove them. Add oil and fry the seasonings (Mustard seeds, red chilies, green chilies, curry leaves and asafetida). Add around 1 ¼ cup of water and let it boil well. Once the water boils add the coconut and the karamani along with salt. Then add the rice flour and mix it well. Take it off the flame and cover the dough and leave it aside for few minutes. Once the dough cools down a bit, bring it together using hands. Make balls out of the dough and flatten it between the palms. 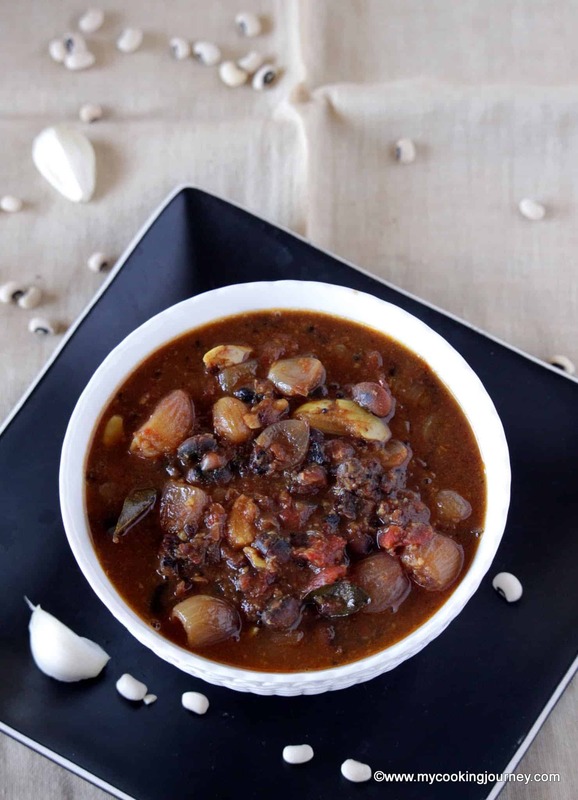 Make a dent in the middle and steam it the same way, we steamed the sweet adais. 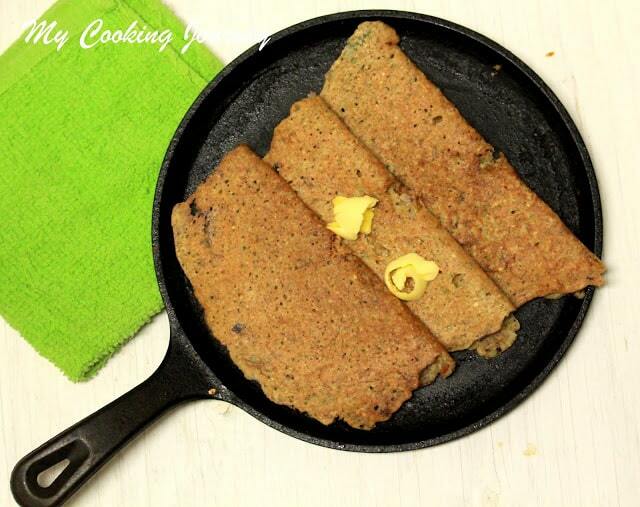 The salt adai does not need as much time as the sweet adai to cook. It should be ready in about 10 mins. Let it rest for few minutes and then remove it carefully. Serve the adais with dollop of butter. 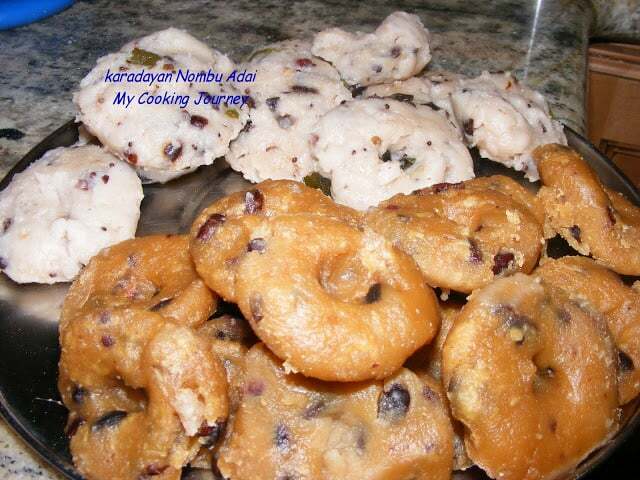 Happy Karadayan Nombu to all my friends and Family!!! 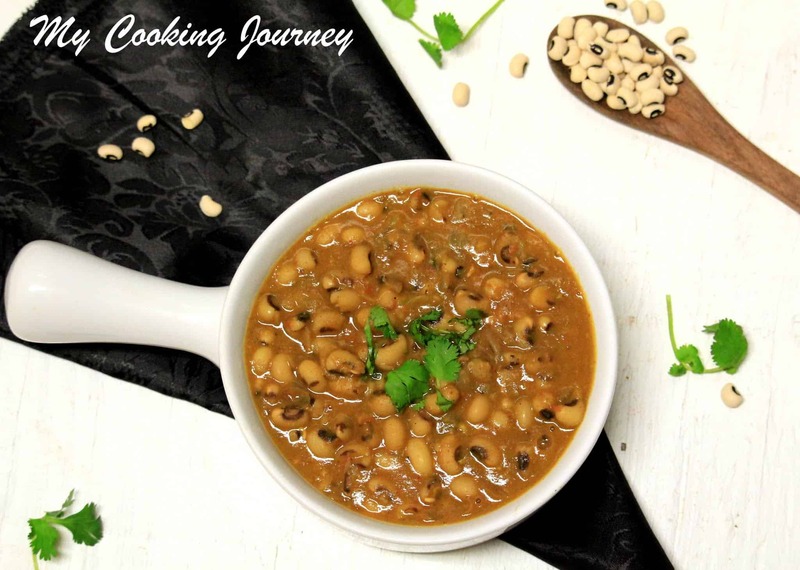 Thanks My cooking Journey. 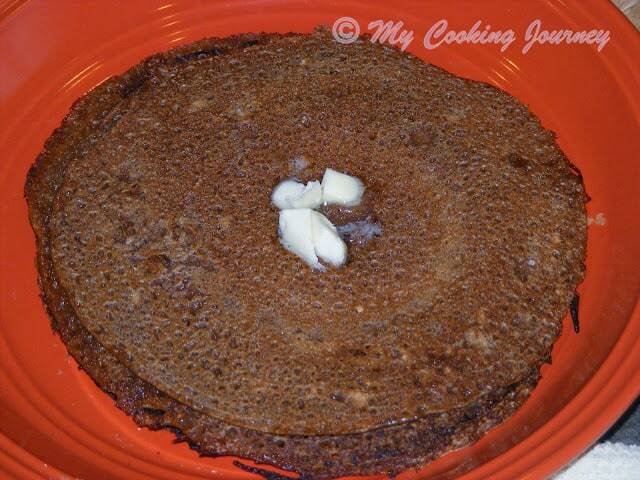 I had small doubt about preparing the adai, Your recipe cleared everything. Lovely adais. I made it too.. 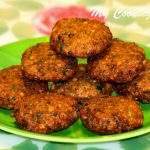 Delicious uppu and vellam adai Sandhya, Karayaan nombu is coming on this Thursday? Wow. Really hard work for this dish u did.